Book News: J.K. Rowling Exposes Origin Of Harry Potter's 'Twee' Nemesis : The Two-Way Dolores Umbridge, enemy of the boy wizard, gets profiled in a new story from Rowling on Halloween. Also: Goodnight Moon goes bilingual, and a campaign for diverse books turns to crowd-funding. 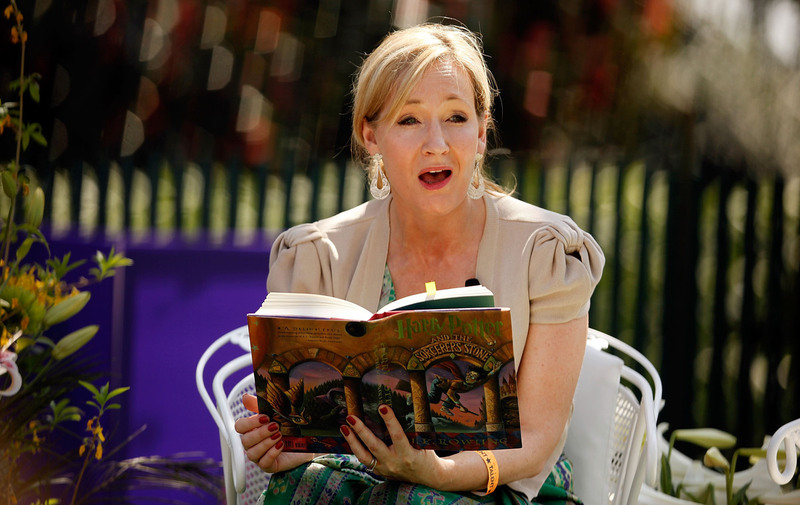 J.K. Rowling reads to children at the 2010 White House Egg Roll. According to a new essay, her own experiences as a young student helped inform the Harry Potter character Dolores Umbridge. Remember when J.K. Rowling promised new Harry Potter materials on Pottermore for Halloween? Well, today she delivered. For those without a membership to Rowling's website, NBC's Today show has republished Rowling's profile of Dolores Umbridge — a villain whose desire to control is, according to Rowling's accompanying essay, "every bit as reprehensible as Lord Voldemort's unvarnished espousal of evil." And like many villains, this character has roots in reality: an old, "spiteful" teacher of Rowling's with a "taste for twee accessories." Seeking Donations Toward Diversity: NPR's Bilal Qureshi noted the rise of #WeNeedDiverseBooks in June, and the campaign has continued to grow. The movement for multicultural representation in children's literature began as a response to a lack of diversity in the lineup of presenters at this year's BookCon. In the months that followed, it has incorporated and become an organization. Now, it's turned to crowd-funding site IndieGogo to ask for donations. "Yes, we'd love to find ourselves in books and read about ourselves and our own experiences, but it's also important to read about people who aren't like us," author Matt de la Pena says in the campaign's video. "It's only then that we'll have a full understanding of the world around us." Diverse Campaign w Thanks Card from Undercurrent on Vimeo. 'Goodnight Moon' Goes Bilingual: That venerable standby of early children's literature has picked up a few new words to go with its pictures. HarperCollins has released Goodnight Moon/Buenas Noches, Luna, which pairs its English text with Spanish translations on the page. GalleyCat says it's the "first-ever bilingual version" of the book, which is available at a reduced price over at First Books. The Pick Of The Picture Books: The New York Times Book Review has announced its list of the 10 best illustrated children's books of the year. Included with the titles are sample pictures from the books themselves. Finished, For Now: In The New Yorker, Nicholas Dames offers a history of that inevitable nugget of text we so often take for granted: the chapter: "Inevitability does not, however, imply meaninglessness. The chapter is tied intimately to our notions of literacy. ... More than this, the chapter has become a way of looking at the world, a way of dividing time and, therefore, of dividing experience." 'Distraction Is On The Syllabus': "The Internet is the greatest poem ever written," says Kenneth Goldsmith of the University of Pennsylvania. The professor, who is also a poet and an editor, tells Newsweek why he's teaching a class called "Wasting Time on the Internet" – which, according to its course description, will require interaction "through chat rooms, bots, social media and listservs," along with readings from such heavyweight theorists as Raymond Williams and Guy Debord. Goldsmith relates the "new digital landscape" to the sleep states explored by the Surrealists, adding, "People say we're not reading and writing anymore. But in fact we're reading and we're writing a lot more than we ever have. It's just not being valued as much."